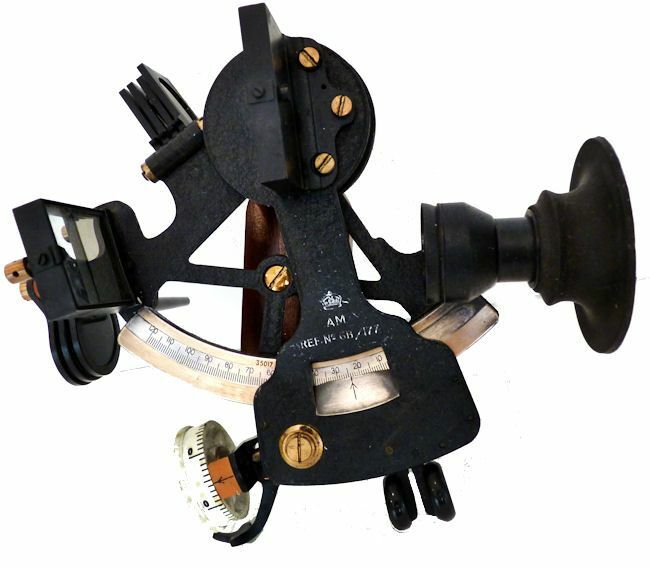 To view our current inventory of pre-owned contemporary premium quakity sextants, click here! This Unique Instrument Has Been Sold. Thank you! Of the smaller size sextants, it is the outright Best! 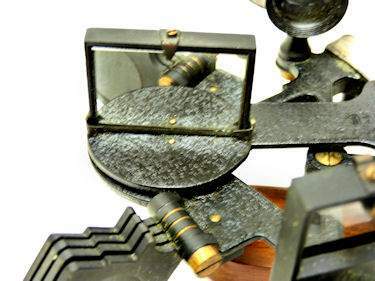 PRESENTED is another gem of a micro-mini tiny sextant that has a radius of arc of only 3 1/2 inches, but has large size mirrors and shades, full size micrometer drum, of regular size sextant. The only thing of less performance is the low powered telescope which is minor. It is the second one we've discovered in this remarkably fine condition. The brass frame is finished in mid-night black wrinkle enamel which is like new. The scale has a silver inlay that is graduated from - 10 to 120 degrees. The index arm has a quick release trigger and vernier which reads to 1 arc minute. There are four index shades and three horizon shades. The fittings maintain their original varnish which has a pleasing age patina. 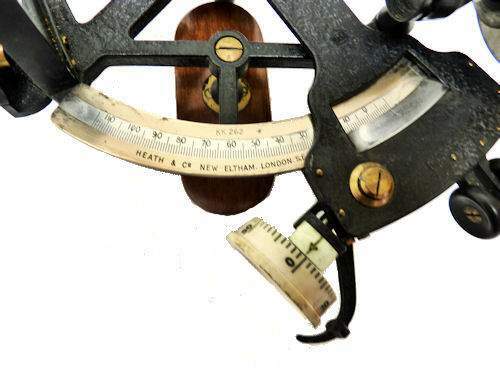 Every thing is designed to make this instrument perform like a full size sextant. AIR MINISTRY DESIGN: The Royal Crown and AM marks indicate this sextant was made for the military which accounts for its exceptional quality. The AM stands for Air Ministry. 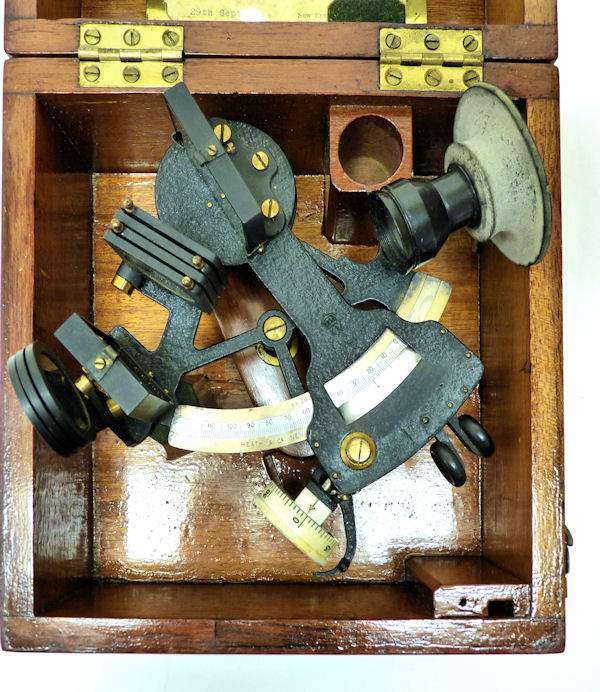 Marine sextants of this type were used on seaplanes for taking anchor bearings and also other calculations such as amplitudes of the sun and distance off angles when on the water. INSTRUMENT CONDITION: The mirrors are in "near new" condition. The index mirror being like new. The horizon mirror has some small Grey specks on the surface and a vertical line 1/64 inch wide at its edge, neither of which will affect sights. Index and side error are nil. The beautiful varnished handle shows no wear. The index arm is complete and in good working order. The frame and all the machinery are in good working order and nothing is missing except a small screwdriver and the upper latch plate. It comes with its original pick to adjust the horizon mirror. All the screws and fittings show their original varnish which has mellowed with age. 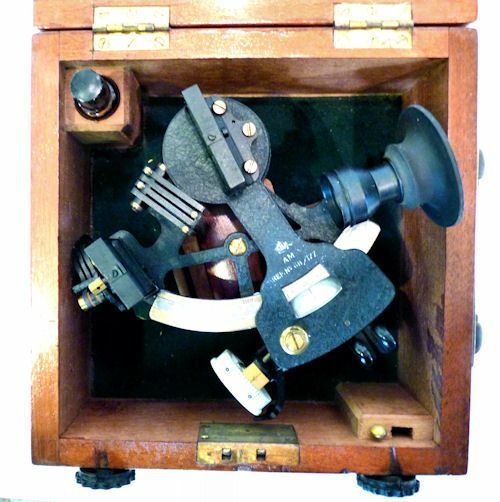 CASE: The sextant comes housed in a high quality, varnished, Mahogany square case with no faults. 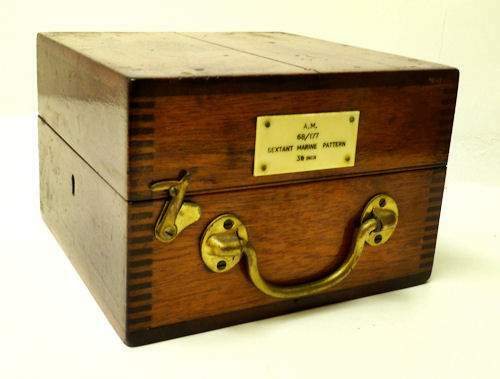 The case has a brass handle, hinges and two rotary latches and a lock, but no key. The upper fitting of the lock is missing. It's varnish has mellowed with age and has a pleasing patina. The round holder in the case holds a small flask of oil. The lower holders are for a pick which is present and a small screwdriver which is missing. THERE IS NO CERTIFICATE: But these type instruments had minor manufacturing errors over their usable range which for all practical purposes could be ignored. All in all, a very rare and exceptionable example from one of the best known English instrument makers. 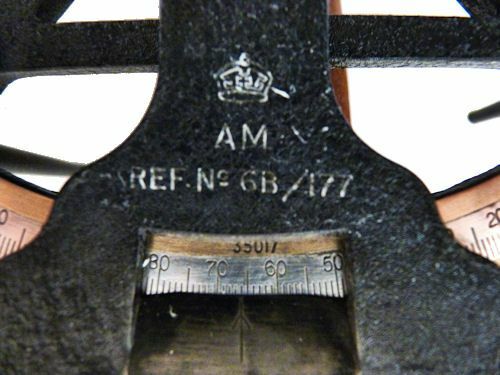 Length of index arm 5 3/4"
Width of frame at arc 5"
BRIEF HISTORY OF MAKER: The Henry Hughes name which we believe to be the maker of this instrumentwas founded in 1838 in London as a maker of chronographic and scientific instruments. The firm was incorporated as Henry Hughes & Sons Ltd in 1903 and in 1923, the company produced its first recording echo sounder. In 1935, a controlling interest in the company was acquired by S. Smith & Son Ltd resulting in the development of marine and aircraft instruments. Following the London office's destruction in the Blitz of 1941, a collaboration was entered into with Kelvin, Bottomley & Baird Ltd, resulting in the establishing of Marine Instruments Ltd. Following the formal amalgamation of Kelvin, Bottomley & Baird Ltd and Henry Hughes & Sons Ltd in 1947 to form Kelvin & Hughes Ltd, Marine Instruments Ltd acted as regional agents in the UK for Kelvin & Hughes Ltd who were essentially now a part of Smith's Industries Ltd founded in 1944 as the successors of S. Smith & Son Ltd. The "HUSUN" trademark was in use starting in the 1920s. 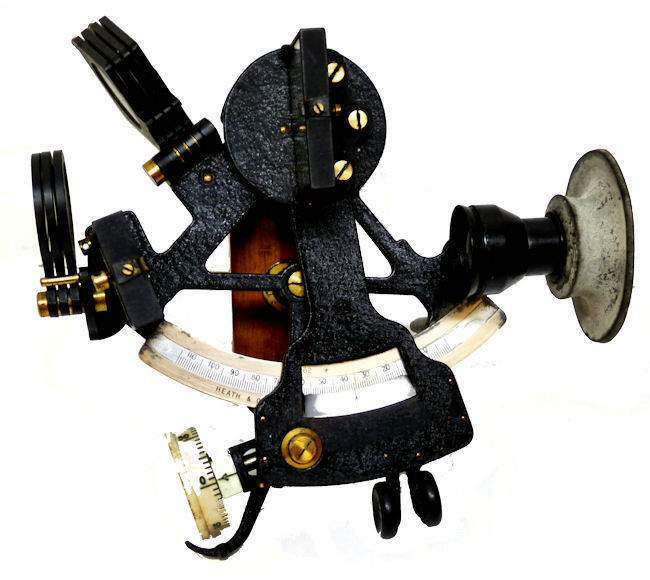 Hughes and Heath made many sextants to the same design this being one of them. 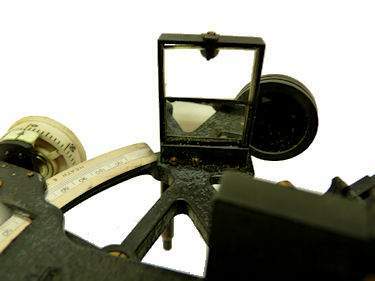 The more recognizable are the three ring sextants one under the Heath Hezzenitth brand and the other under the Hughes, Husan brand. Both arelikely the most numerous ever produced, and can still be found in great quantity today. OUR UNCONDITIONAL NO NONSENSE GUARANTEE: If not completely satisfied with your purchase it may be returned, if without damage, within three days of receipt in its original condition and packaging. Returns must be insured for their full value. All that is required is a prior email authorization by us for the return. The cost of shipping, packaging and handling will be refunded if we are at fault within the Continental United States. International buyers welcome, but inquire first. We have satisfied customers in Argentina, Australia, Austria, Belgium, Bermuda, British Virgin Islands, Canada, Chile, China, Czech Republic, Democratic Republic of Congo, Denmark, Estonia, England, France, Germany, Greece, Holland, Hong Kong, Hungary, Iceland, Indonesia, Ireland, Israel, Italy, Japan, Kuwait, Latvia, Luxembourg, Malaysia, Martinique, Mexico, New Zealand, Nigeria, Norway, Nova Scotia, Panama, Philippines, Poland, Portugal, Puerto Rico, Russia, Romania, Saudi Arabia, Scotland, Singapore, South Africa, Spain, St. Maarten, Sweden, Switzerland, Thailand, Turkey, United Arab Emirates, USVI and the Eastern Caribbean. 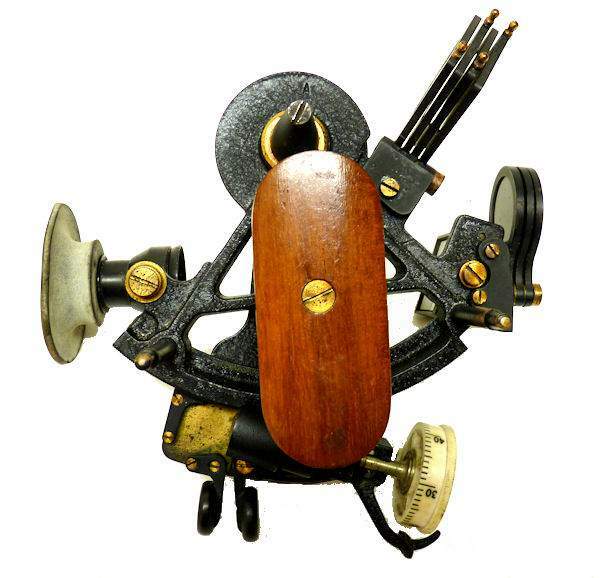 Buy this very special historic navigation instrument. It is a great find for that special person who can appreciate only the finest and most unusual. 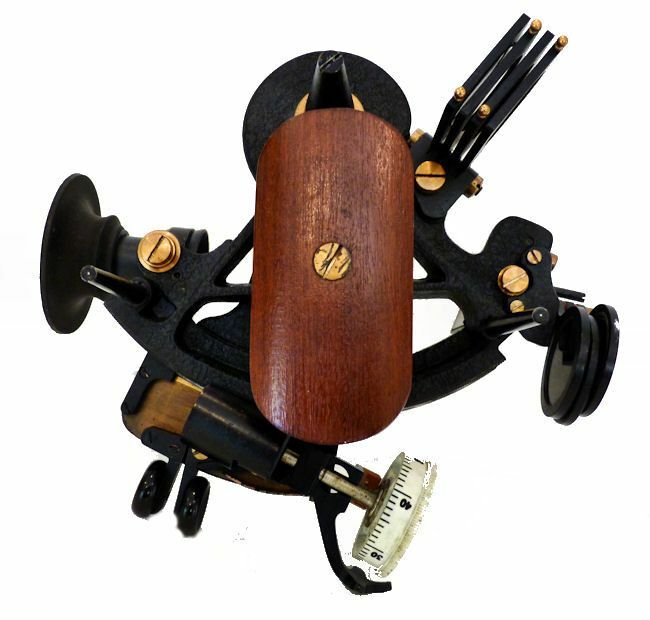 To view our current inventory of other premium quality contemporary sextants, click here! 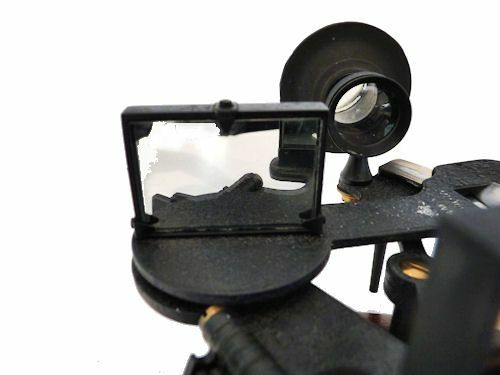 PRESENTED is a gem of a micro-mini tiny sextant that has a radius of arc of only 3 1/2 inches, but has large size mirrors and shades, a full size micrometer drum, and low powered telescope. The brass frame is finished in mid-night black wrinkle enamel which is in excellent condition. The scale is of non-tarnishing platinum and is graduated from - 10 to 115 degrees. The index arm has a quick release trigger and vernier which reads to 1 arc minute. There are four index shades and three horizon shades. The fittings maintain their original varnish which has a pleasing age patina. Every thing is designed to make this instrument perform like a full size sextant. PROVENANCE: U.S. Customs papers show it entered the United States, August 4, 1955. It was purchased by its last owner and used at sea from 1974 - 1978 including passages to the Bahamas, Caribbean down to St. Vincent, the Panama canal and over to Tonga. For the last 33 years it has been on display. INSTRUMENT CONDITION: The mirrors are in remarkably good condition for their age and use at sea with the index mirror being like new. 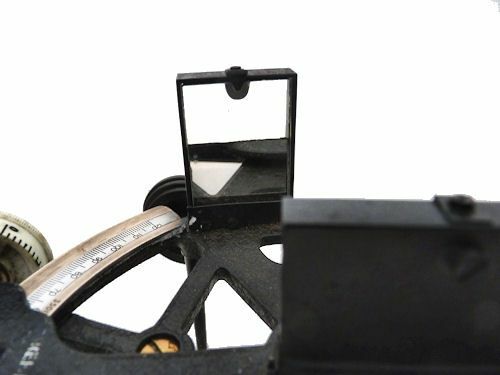 The horizon mirror has one small speck on the surface and a vertical line 1/32 inch wide, neither of which will affect sights. Index and side error are nil. The beautiful handle with bright varnish shows no wear. The index arm is complete and in good working order. The frame and all the machinery are in good working order and nothing is missing except a small screwdriver and pick. All the screws and fittings show their original varnish which has mellowed with age. 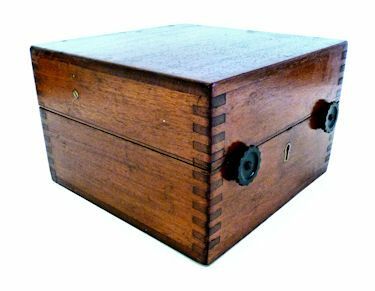 CASE: The sextant comes housed in a high quality, varnished, Mahogany case, and a tag on its side is labeled on four lines, A.M.; 6B/177; SEXTANT MARINE PATTERN; 3 1/2 INCH. The square case has an age crack on the top, but is sound. The case has brass handle, hinges and latches and a lock, but no key. Its high gloss varnish has a warm patina of age. The round holder in the case was for a small flask of oil. The lower holders are for a pick and a small screwdriver. CERTIFICATE: The original certificate by the Hezzanith Instrument Works is dated 29 September 1943. It shows that the instrument is free of error over its usable range and is fitted with a two power scope.